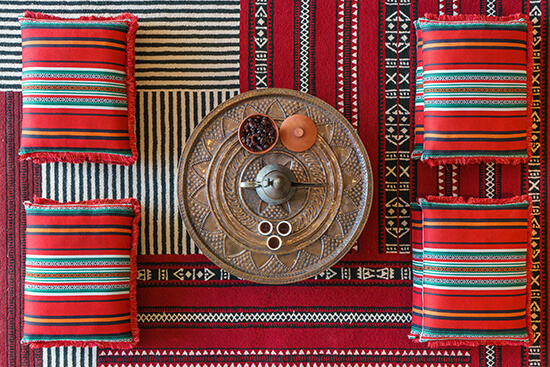 A symbol of Omani hospitality and often a daily staple, kahwa (cardamom-infused coffee) and dates are usually offered to guests and visitors upon arrival (start grovelling if they’re not!). 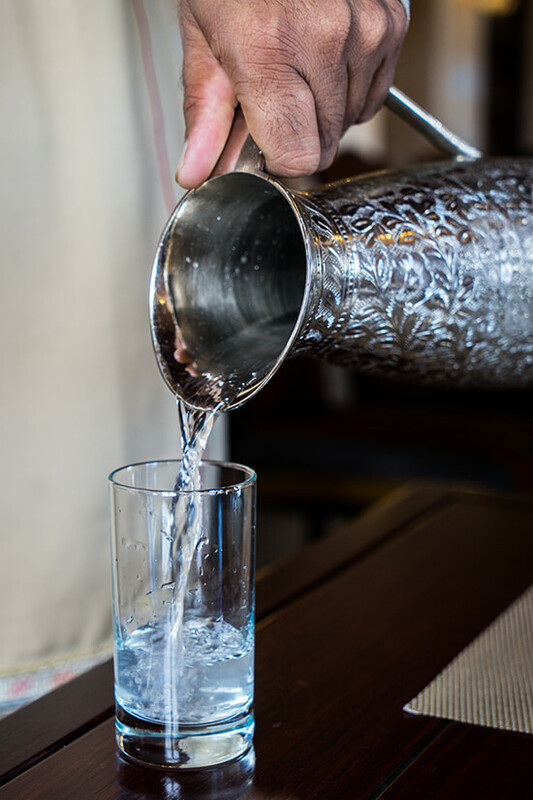 The kahwa is unsweetened; however, its bitterness is balanced and counteracted with the delectably sweet dates, of which there are over 250 varieties in Oman alone. A popular rice dish that is often accompanied with meat (chicken, mutton or fish), Maqboos is a hearty concoction of cinnamon-y, cumin-y and cardamom-y goodness. The meat (or fish) is cooked with a range of herbs and is served on top of rice with a sprinkle of roasted pine nuts. Many other Gulf countries have their own version; however, Oman takes the biscuit (or the maqboos) here. Oman is one of two places in the world where you can find Frankincense. Side note: this is why many people think the Three Wise Men came from Oman. Frankincense trees grow in the south, but the sap crystals are sold everywhere. Frankincense is mainly used as an incense, but sometimes the highest grade quality is consumed or dissolved in water (in small amounts!). Bait al Luban, a local restaurant on the waterfront in Muscat, serves up a mean (and free!) brew of frankincense-infused water. That may not sounds too appealing, but it’s a surprisingly refreshing novelty that is believed to have innumerable health benefits and also makes your pee smell great! 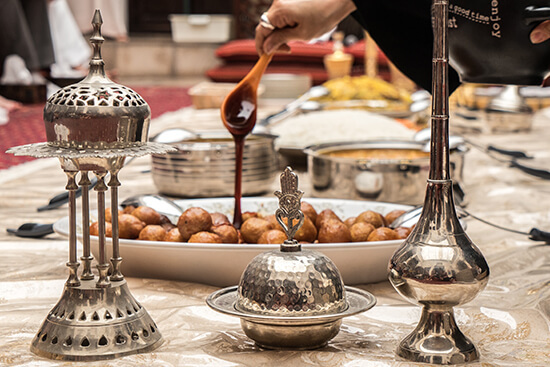 Omanis love their sweets, so a list of food from Oman would be incomplete without something sugary. These doughy balls are infused with cardamom and deep fried until slightly crispy and golden brown. Served with cardamom and date syrup, they’re often used as an accompaniment to coffee or at the end of the meal as a dessert snack. Think maple dough balls dripping in maple syrup! If you’re driving in Oman and end up stopping at a petrol station, make sure you try one of the roadside cafés. 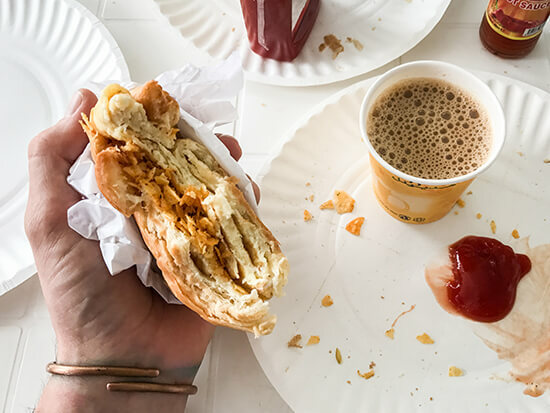 It’s not fine dining, but it's a true Omani fast food experience! There’s a slight aggressive knack to ordering (roll down your window and just shout! ), and make sure you try a roll stuffed with egg and crisps. Wash it down with a bit of karak (cardamom tea) as well. 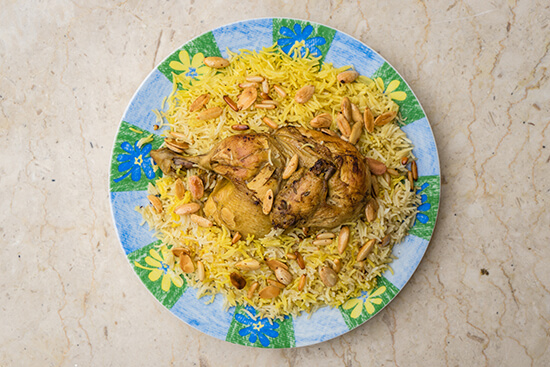 The pièce de résistance, shuwa is Oman’s national dish and definitely one not to be missed. It takes up to 48 hours to make as the cooking process is pretty complex, and is often reserved for special occasions. Meat (sometimes a whole goat!) is marinated in a blend of oil and spices, wrapped in palm fronds, and then slow-cooked underground over hot embers. Flavours vary slightly, but the dominant spices include cumin, cloves, coriander, cinnamon and nutmeg. You’re guaranteed to be full after this. Make an appointment with one of our Travel Experts and start planning your holiday to the Middle East today.